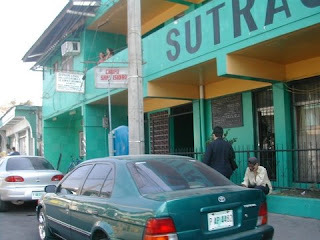 These are some photos that I was able to take at a quick stop at the Turiplaza center just outside of El Progreso. El Progreso is a medium-sized city, only slightly smaller than La Ceiba, on the highway about 30 minutes east of San Pedro Sula, and about 2 hours west of La Ceiba. "An unattractive, hot agricultural city of 115,000 on the east bank of the Rio Ulua, El Progreso offers little to interest tourists. 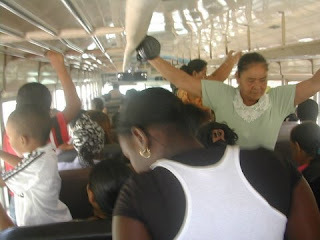 Most foreigners who find themselves in El Progreso are changing buses on their way between San Pedro Sula and Tela. 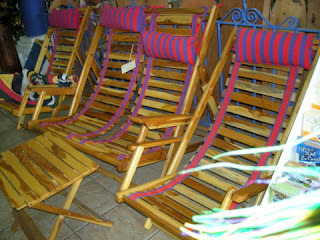 The only reason to delay your departure might be to check out two souvenir shops in town." Awww! El Progreso is not that bad. It actually looks better and cleaner than it did a few years ago. Agriculture might be big, but the maquilas (usually foreign-owned factories) seem to be having a larger effect. El Progreso has a big, brand new mall just outside of town on the highway and an overabundance of fast food franchises, neither of which agricultural workers can afford. Many of its citizens commute to San Pedro to work. 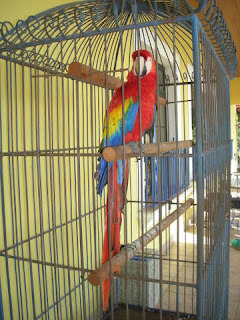 This scarlet macaw is in a cage outside the front door. He seemed content. It's amazing to find such colors in nature. It looks more like something an inventive child would dream up with their 12-crayon box. 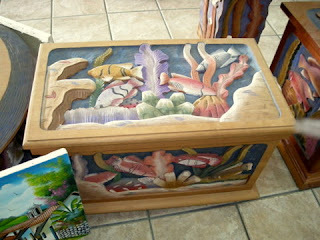 Honduras is known for its caoba (mahogany) and has talented carvers. I like the unpainted wood much better than the painted, which to me has a cartoonish look which takes away from the beauty of the wood and the fine carving. 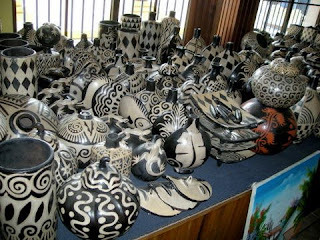 This photo shows Lenca pottery. The Lencas are an Indian tribe native to Honduras who still make this pottery the way it was made hundreds or maybe thousands of years ago. You can learn more about the Lencas at The Worldwide Traveler and even purchase the pottery and jewelry online at my friend Sam's Lenca Art Store. I have one piece and would like to get more. I love the designs and simple colors. Sadly, there was no time to shop on this visit. 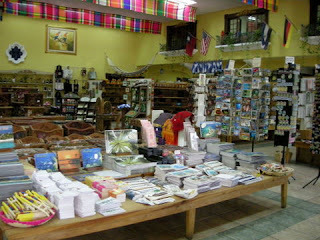 In addition to handicrafts, Turiplaza sells all the typical souvenir type things, including postcards, notecards, key rings, coffee cups, t-shirts, jewelry, etc. 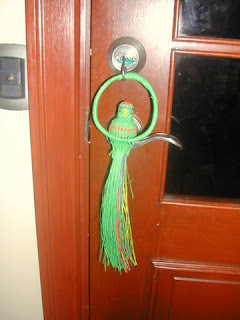 I don't know what this bird on a ring is supposed to be used for but I was looking for a LARGE keyring so we can remember to take the key out of the door at night and this one fit the bill. 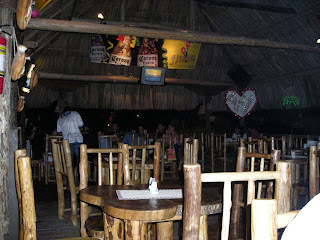 If you are driving on the main highway between San Pedro and Tela, Turiplaza is definitely worth a stop. 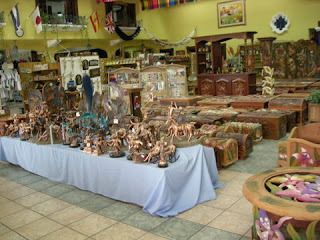 It has a good selection of Honduran crafts especially if you are looking for carved wood. Mercado Guamilito in San Pedro is also fun for shopping − we found some excellent hammocks there years ago − and one of these days we have to go back for more shopping and photos. Turiplaza is supposedly open from 7:30 a.m. to 5 p.m, Monday through Saturday, and 10 a.m. to 5 p.m. on Sunday, but we've tried to stop in several times during those hours and they were closed for one reason or another. If you want to call first to make sure the store is open, the number is 504-657-2200. 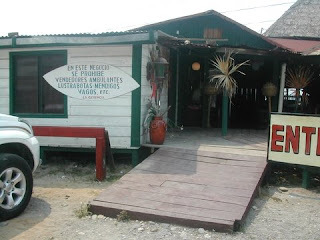 I wish I could give directions but the best that I can do is say that it is on the highway going east from El Progreso. Below is a photo of the building from their website. Look for it on the north side of the highway. we'll drop in there wet (illegal). I was hoping to have a definitive update on the Honduran melon situation but apparently we won't hear the results of the testing until next week. Dole and Chiquita, who are both customers of Montelibano, have voluntarily recalled all melons sold by their companies in the U.S. and Canada. The Honduran melon ban apparently has been lifted against other Honduran melon exporters but remains in place for Montelibano. FDA inspectors performed 149 tests of melons of the Honduran company Del Sol and has approved those melons for entry into the U.S.
FDA Inspectors have arrived in Honduras to evaluate the production process of Montelibano. U.S. Ambassador to Honduras Charles Ford stated that this is a technical and scientific mission and that the results won't be announced until the tests are completed and analyzed. What they could expect to find 10 days after the fact, I'm not sure. Maybe their purpose is ensure that the melons currently being harvested and packed do not contain salmonella in order to be able to lift the ban, rather than to prove that salmonella existed previously. "Gringos: Go on everybody, eat melons!" Both company and Honduran government officials continue to vehemently deny that the melons were contaminated. 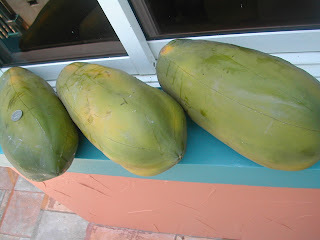 While claiming that they have received no scientific proof from the FDA that the salmonella outbreaks came from Honduras, President Mel Zelaya ceremoniously ate some melon for a press conference which "proved without a doubt" that the fruit had been contaminated in the U.S. That is the kind of show that is "eaten up" by the Honduran public, though who knows where that particular melon came from or what sanitizing process it went through before he cut into and ate some of it. 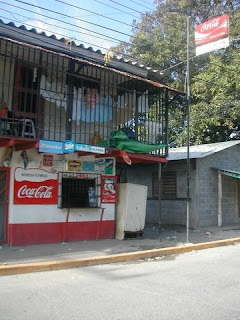 Many Hondurans believe that this whole situation is a plot against Honduras by the U.S. government to punish them for President Zelaya's friendliness with Venezuelan President Hugo Chávez, propaganda that has been promoted by government officials and some of their allies in the media, as well as, of course, Hugo Chavez, who has offered to buy the rejected melons. I wonder how Venezuelans feel about that. I'm not sure how those who believe the conspiracy theory can explain the thousands of other product and food recalls against other foreign companies as well as U.S. companies. Ambassador Ford pointed out that the U.S. provides Honduras with U.S. $100 million in agricultural support each year and has no desire to damage the economy of this country. As hard as it is to imagine, the powers that be seem to have convinced the majority of Honduran public that this is an evil-empire plot of the U.S. It is really kind of scary how easy it is to manipulate the Honduran public. Freedoms of opinion and the press, while enshrined in the law, are not fully reflected in practice. Because the exclusively private press, radio and television market is highly concentrated and dominated by some of the politically and economically most powerful individuals or families, there is little plurality of opinion. Censorship is not exercised openly by the state, but it continues to be informally carried out by other political and economic powers, particularly through bribery and through the dismissal or intimidation of critical journalists. While former President Maduro seemed to have negotiated with media owners, the Zelaya government is said to keep journalists docile by directly offering them legal or illegal advantages that may range from accompanying the president on journeys abroad to cash payments. Political and bureaucratic corruption is still endemic and citizens consider corruption one of the most urgent problems impairing good governance. In 2006, the U.S. government withdrew its financial aid to Honduran counter-narcotic institutions, such as the Consejo Nacional Contra el Narcotráfico (CNCN), claiming that it had evidence that corrupt high-ranking officials were systematically sabotaging anti-drug trafficking efforts in the country. Initiatives by the government and the legislature to prosecute corrupt officials and end impunity (e.g., the approbation of the “Ley de transparencia y de acceso a la información pública” in 2006), are largely seen as a mere image campaign by the political elite. Overall, anti-corruption measures have so far proven ineffective, primarily due to the judicial system’s inefficiency and lack of independence. This applies not only to the courts, but also to state prosecution authorities. In the period under review, convictions of corrupt officials have occurred - for example, that of Ramón Romero, former director of the migration agency, in 2005 - but only very few. In general, the elected government commands the effective power to govern despite the fact that important economic groups and drug trafficking interests hold de facto veto powers. President Zelaya expressed in an informal meeting with civil society representatives his belief that about 70% of the police is infiltrated by organized crime. Once again Honduras has hit the international headlines and as usual it's not a good thing. 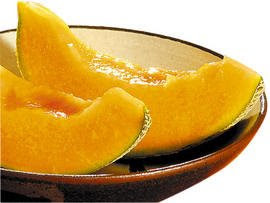 The US Food and Drug Administration has reported that Salmonella outbreaks in 16 states in the U.S. have been linked to Honduran cantaloupes. The Canadian Food Inspection Service has followed suit after nine incidents. Agriculture is one of Honduras' major industries and a bad reputation could really hurt the country's already depressed economy. President Mel Zelaya has declared the FDA's announcement to be unfair, extreme, and imprudent, saying that the contamination could have occurred by mishandling in the U.S. grocery stores. While that may be true, it seems unlikely since the canteloupes, packed in boxes, were shipped all over the US and Canada. I think he would have been better served to declare that a full investigation is being done and that appropriate measures will be taken here in Honduras. I think that a flat denial and pointing fingers just won't fly as well in the U.S. as it does here in Honduras. As big a deal as this has been in the U.S., it is even bigger here. Today's La Prensa is full of reports from the President, the grower, and the Minister of Industry and Commerce, who has demanded immediate suspension of the embargo and a written apology from the FDA as well as indemnization for the company's losses which are currently estimated to be US $4-8 million. Humpf! That will be a cold day in you-know-where, don't you think? The general manager of the company in question, Agropecuaria Montelíbano, says that its produce is routinely inspected by both Honduran and US experts as well as by Dole and Chiquita experts who are also customers of the company. Company executives flew to the US yesterday to meet with the FDA officials. Although one specific grower has been mentioned, when this is all over, the only things that people will remember are "cantaloupes" and "Honduras" so it could have lasting effects on the agricultural export market of Honduras. I've been doing some research on salmonella. Did you know that one type of Salmonella bacteria causes typhoid fever? 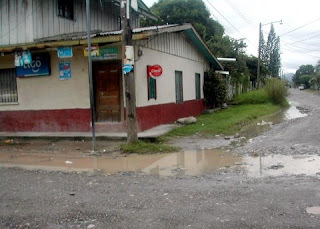 Yes, we have typhoid fever in Honduras and a recent newspaper article indicated that it is on the rise. As far as Salmonella outbreaks in Honduras go, it's not the type of thing that most people would or could seek doctor treatment for so it's not likely that there are any reliable statistics. I didn't even go to a doctor when I had it. All the sources that I read agreed that preventative measures include washing hands with soap and water before doing anything in the kitchen and frequently during food preparation, especially after handling chicken or meat. They also recommended washing food containers, utensils, and work surfaces with hot soapy water to reduce contamination and cross contamination of other foods. Other tips include keeping hot foods hot, cold foods cold, keeping foods that need refrigeration in the refrigerator, not leaving foods sitting out in the kitchen, etc. − all tips that are general common knowledge in first world countries. However, all of these tips are usually disregarded in the kitchens that I've been into in Honduras and by the maids who have worked for me. Rubbing a green scrubby pad encased with grease and food particles over a container which held raw chicken or other meat and then using the same scrubby to wash dishes or clean the countertop is just not hygienic! The only tip that seems to be religiously followed is the full cooking (over-cooking) of foods. One of the most interesting things that I found is that salmonella can cause swelling of joints and joint pain which can last for months or years and can lead to chronic arthritis. Arthritis is a big concern among Honduran women who believe all sorts of old wives tales having to do with getting your hands hot or cold or wet at certain times or in certain order. Sorry I can't be more specific about these theories because these things just don't make any sense to me. It might be a stretch to say so, but maybe all the worry about arthritis among women here in Honduras could be avoided by doing the very things that old wives tales tell them NOT to do. It's widely believed that using hot water causes arthritis. A lifetime of exposure to all these bacterias in their food, water, and kitchens could be the real cause. Both Salmonella and E-Coli bacteria live in the intestines and in feces − not a nice thought at all. Meat products are more likely to be the cause of infection but produce can be widely contaminated if exposed to sewage-contaminated water. If the contaminated Honduran melons are as widespread as reported, it seems likely that it is a result of contaminated irrigation water. That makes me think that all Honduran produce could be a risk since there is so much water pollution here unless some method of sanitizing the produce before shipping is employed. Thinking about it, surely some sort of sanitizing must be routinely performed by exporters or this kind of scare would come up a lot more often. To reduce the risk of salmonella and E-coli in fruits and vegetables, wash produce in plain water or with water with bleach (1 to 3 teaspoons of chlorine bleach per gallon) followed by a plain-water rinse can reduce the number of pathogens and other microorganisms on produce. I haven't used bleach in the past but I think I'm going to start. I've always washed produce well under our non-contaminated faucet water and then rinsed with purified water. That is probably not enough. Currently, they say there are 1,000 containers of fruit waiting on the docks at Puerto Cortés. Unless exoneration comes quickly, I imagine that the remaining contaminated fruit will be dumped on the Honduran public. Time is such an important thing in the US. Not so here in Honduras. Appointments are mere suggestions and many businesses will not even make appointments because they know that most people won't show up at the appointed time anyway. Just show up and wait in line like everyone else. It's the Honduran way. To show you how corrupted I've become, unless I'm on my computer (and more on that further on) I currently have no idea what time it is or often even what day it is! El Jefe bought me a watch a couple of years ago. The battery went dead about six months later, and I've been carrying the thing around in my purse for a year and a half. I can never remember to look for a battery when I'm out. 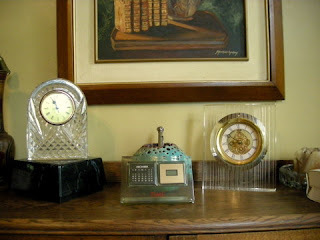 Ironically, I have a collection of antique clocks and small battery operated clocks. Almost every room has one, two, or three clocks in it. ALL of them are now stopped and all show different incorrect times. We usually keep the stove and microwave clocks set. The microwave won't even operate unless the time is set for some very annoying reason. Why there is no battery backup for the clock is beyond me. With the unstable power situation here, those clocks usually get reset at least three or four times a week and sometimes more than once per day. We don't ever bother with the TV, stereo, or other assorted clocks, because they aren't blinking in our faces to remind us. So how do we reset the clocks if we don't know what time it is? Usually with our cell phones. However, about a month ago when I was rushing around to get ready for a visitor, I glanced at my cell phone and discovered that the time was off by about 7 years, 2 months, and 15 hours. I still haven't figured out how to change the time on my cell phone. How do we set the time on the cell phones? With the computer clock. While I was setting up my new computer (and still am), I found that the clock was wrong. I went to bed two hours earlier than usual one night and discovered the mistake when I looked at a battery operated clock on my nightstand − which incidentally doesn't keep good time either but it is usually within 20 minutes or so. So the next morning, I reset the day and time on the computer. I knew it was a Friday so studying the calendar, I thought: "It must be March 7." Wrong! I discovered a day or two later it was March 14th. I lost a whole week. I usually have a general idea of the day and date from reading the newspaper but I'm way behind on my reading. Today, the Saturday Ceibeño section was delivered on Sunday and even Chloe brought us Sunday's newspaper on Monday last week so I was really confused. We aren't completely unreliable. We have one little dependable travel alarm clock that we use when we really, really have to be somewhere at a certain time. At one time the exact time was very important to me, but I kind of like it this way. It takes the pressure off. However, I've become pretty good at telling what time it is by the sun! Cloudy days are a problem, though. We are finally getting some egg action out of our four hens. Conchita, the mama hen, spends half her life being broody − wanting to sit on eggs instead of deliver them − but the others have finally grown up enough to get started laying. These are bantam hens and their eggs are small, but these are even smaller than Conchita's. Conchita's egg is the larger one in the center. The white egg at the top is a large-size grocery store egg for comparison. I'm hoping that as the hens mature, the eggs will get just a little bigger. These eggs are delicious − more flavor than the egg factory eggs. 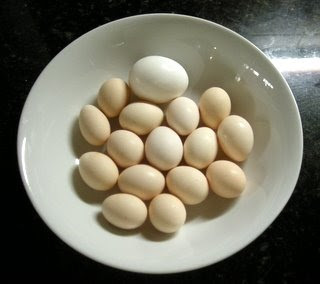 The yolk color is much brighter because the chickens eat grass and whatever else they find as well as corn, rice, oatmeal, fruits, veggies, yogurt, etc. The proportion of yolk to white is much higher. 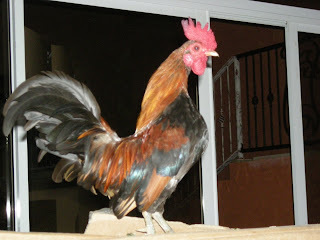 The shells are harder as well which means that the hens get plenty of calcium in their diet. Sometimes I have to bang them three or four times to get them to break. I calculate these eggs cost about US $5 a piece, but they are organic! Hopefully in the future the cost per egg will decrease. Speaking of the cost of eggs, I just have to mention that I read yesterday the the cost of an egg in Honduras has risen to L.2.90 each (US $0.15). They were less than L.1.00 when I came to Honduras (about US $0.06 adjusted for the difference in exchange rate at that time). This and all of the other increases in food prices in the past year or so make it very difficult for the poor. The increases in minimum wages have not kept pace. Wow! I didn't know I could write in Chinese. I wonder if I have any spelling errors? 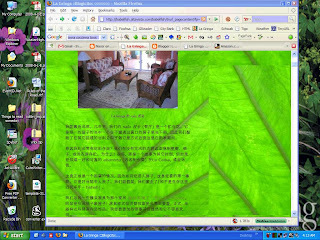 Click here and you can even read your comments in Chinese, too. Hey, some of your names translate! How cool is that? I just took the practice test at Typing Certification.com. I keep putting my fingers on the wrong keys. 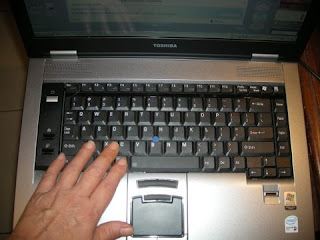 I've been working on setting up my new Toshiba laptop (Yay!). What a nightmare − not the computer, but the process (Boo!). It has been six long years since I've done this and it not only feels like I am starting back over again learning about computers but I'm also learning how to type again. Seriously, though I put myself through the first few years of school by typing, I think I'm going to have to pull out Mavis Teaches Typing − the keyboard feels that different. I haven't had wireless before and it seems to be having a problem downloading all those big updates. I've tried to update McAfee at least 10 times and I'm just about ready to give up and go back to the free Zone Alarm and AVG Antivirus programs. 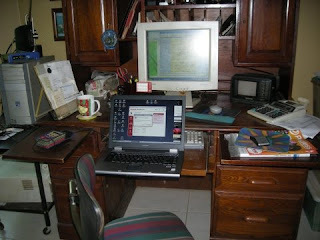 The laptop feels so foreign − maybe it's laptop culture shock or just the stress of something new. I've been busy downloading, installing, and updating all my programs and getting all my settings just the way I like them so that I feel at home. Every program wants to put an icon in the system tray and to check for its own updates every 10 minutes. As fast as I can delete them, more are added. I have noted an improvement in some of the newer programs. They ask for permission and actually give you an option to check for updates at a more reasonable interval, say, once a month. How polite. Thank you. I haven't even started to transfer my files and photos yet. Nor have I looked into the best way to do that so if you have any ideas, pulllllllll-eeeeease let me know. This process for which I thought I needed two or three days is beginning to look like it will take two or three weeks. Thank goodness I bought Windows XP and not Vista! Well, I just checked the McAfee downloader and it tells me that I have only 99 hours and 15 minutes to go on the download. Arrrrghhh! Okay, Honduran readers, this one is for you. I rag on Honduras and Hondurans all the time, and you take it soooo well, so I thought you might enjoy a peek into what it is like to be white. Linked on one of my readers blogs, I found the most hilarious blog called Stuff White People Like. #75 Threatening to move to Canada ....or Honduras? This blog has had almost 9 million hits! It must be funny. I'd love to read your comments about it and hear what your favorites were. Now this is going to have to keep you busy for a few days because I'm taking some time off. What haven't I written about? I'm finding more and more that I have to search my blog to find out if I already wrote about something. By the way, those search functions (at left-top and in the upper sidebar) work pretty darn well. I used to remember and could often even remember the title and the month that I wrote it. No more. After 637 articles, it's all getting fuzzy. The problem is compounded by my babbling on the Honduras Living group and forgetting if I mentioned something here or there. Then there are all those emails. Where did I say that again? So, tell me what I'm missing, please. It rained non-stop all day yesterday. 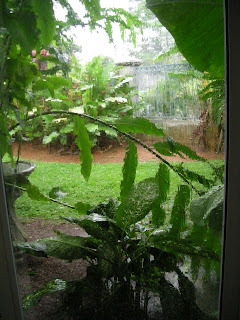 We seemed to have been firmly into dry season, so the rain was welcomed by me. 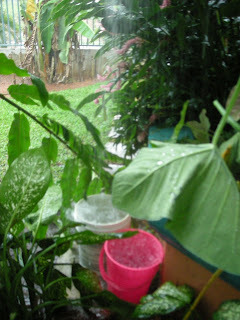 Checking the Blogicito's archives, I see that we had three days of heavy rain at just about this same time last year. Since we hadn't had running water since we went to bed on Thursday night, El Jefe took the opportunity to clean and refill all of our water storage buckets with nice clean rainwater. It took only about 2 minutes to fill each 5-gallon bucket from the downpour from a valley of the roof. Just as he had filled the pila for current use and refilled most of the buckets, our running water was restored. Oh well, you always need a fresh stash of clean water in Honduras. He thinks there may have been a problem with the well pump. I think it is more likely that the construction workers just forgot to turn the water back on when they left on Friday and they didn't come to work Saturday because of the rain. I'm so disappointed that I still haven't gotten my rain gauge made. (The one I talked about a year ago and seven months before that, too!) We finally took a drawing to a welding shop and the darn place has kept it for a month and hasn't even given us a quote yet. The last time I put the 12" (30 cm.) glass vase out in a hidden spot without the iron holder, Chloe, the Rotten Rottweiler, apparently found it, picked up the vase, and dropped it on the concrete leaving broken glass everywhere so I don't dare try that again. My new straight-sided glass vases are 24" (61 cm.). I bought two just in case one gets broken and I can't find another to fit the holder − if we ever can get a holder made. Hopefully, that will be sufficient. 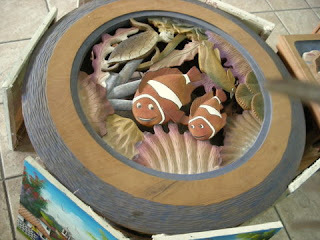 But, hey, we are in Honduras, where you can get iron things made or even altered pretty reasonably priced. That's a good thing. Prepare yourself for boring posts next rainy season (September - February) saying, "We had 14 inches of rain yesterday!!" By the way, isn't that so typically U.S. American to feel the need to measure the rain? I get an incredible number of missed calls on my cell phone. It's probably about 10 to 1 for the calls that I receive. I usually have my phone close by (El Jefe would definitely argue this point) but I don't feel the need to carry it to the bathroom or to bed with me or when I go to feed the chickens or when I'm doing laundry or answering the door or cooking and some days I just forget to turn it on....okay, well, I guess El Jefe is right. The surprising thing is that most of the missed calls are not from anyone already in my phone list. Maybe my few friends have changed phone numbers (had their cell phones stolen) and they are trying to call to let me know. Can you tell I don't use my phone much? The missed calls could be the one ring signals to call someone back. But most of the time, when we call back it turns out to be a wrong number which invariably takes 5 minutes to confirm. So now we just ignore the missed calls. It seems that no one uses voice mail. I wonder why. Caller: Blah, blah, blah, Pancho, blah, blah, blah. .......... You have the wrong number. Caller: Yes, but who is speaking? Me: There is no Pancho here. Caller: Is this blah, blah, blah (maybe a radio station*)? Me: No, sorry, you have the wrong number. Me: No, you have the wrong number. Caller: It's not blah, blah radio station? It would be easier to say "Wrong number!" Click! but I look at it as a non-threatening way to practice my telephone Spanish (it's a stranger) and we don't pay for incoming cell phone calls in Honduras (it's on his dime). Some callers are even more persistent and determined to make me admit that I truthfully am the person that they intended to call. I'm beginning to understand this approach, however, as I've heard El Jefe make calls where the person's wife will seem confused, saying "Who? Jose? What? Who is this? Who are you calling? What do you want? Jose who?" literally for minutes. Just as El Jefe begins to think that he does, in fact, have the wrong number, she'll hand the phone over to her husband, without, of course, telling her husband who is calling or what he wants or anything else she gleaned from her 15 questions. The same thing can happen when calling businesses, believe it or not. El Jefe can say, "Is this Electricos?" and after a 5 minute conversation with a very confused employee who says, "What? No. Who is this? Who are you trying to call? What? No. Who? ", he'll finally hear, "Well, yes, this is Electricos. What do you want?" By the way, telephone calls in a foreign language are hard! I've had some successful telephone conversations lately. I've rescheduled a dentist appointment, discussed a neighborhood meeting, did not renew my newspaper subscription and explained why, and later did renew plus arranged a convenient time to give the collector our payment. This wasn't just listening and saying okay, but actually involved offering alternatives and asking questions. I'm feeling really good about that. * Apparently call in radio shows cause a lot of wrong number calls. Trish gets them, too. This is a quick and easy recipe that you are going love. Guaranteed! My neighbor suggested this to me one day when I was saying that we can never finish a whole papaya. He didn't give recipe specifics, just the ingredients, so this is my version. Depending upon what kind of milk and how much you use, this simple recipe can taste just like rich ice cream (and you will need a spoon to eat it), a milkshake, or a smoothie. Even with low-fat milk, it tastes very rich, like a creamy soft-serve ice cream. Really! I'll have to say that it tastes very close to my actual papaya ice cream recipe without near the fat or calories or the time involved. Put the first three ingredients in the blender and pour in 1/2 cup milk for ice cream-like results or 1 cup milk for a milkshake. Blend until smooth. Taste and adjust the milk and sugar as desired. Serve icy cold. Of course, you could use juice or yogurt instead of milk, omit the sugar or use a sugar substitute if you want to deprive yourself. This is such a quick and easy dessert if you keep some papaya chunks in the freezer. 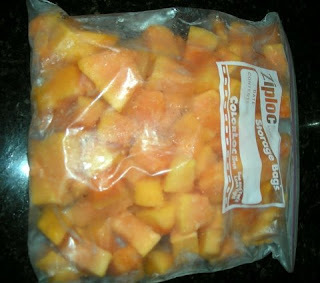 See my tip for freezing papaya yesterday. The papaya I used was on the pale side. Generally the color of the shake is brighter and oh-so-pretty. Consumer Warning: This recipe can become addictive. Papayas are so big! At least the ones we grow or buy here in Honduras are. We can't hope to finish one while it is still fresh, even though we've been using a lot lately in our homemade yogurt. 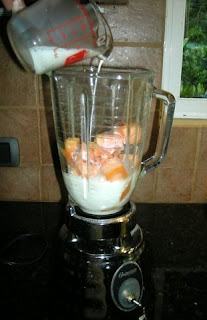 A neighbor recommended to me a long time ago to cut up the papaya and freeze the chunks for a tasty licuado (milkshake). I loved his recipe so I'll share it with you tomorrow. 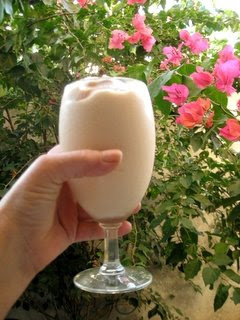 It was a great idea and blended in a drink, you can not tell the difference between fresh or frozen papaya. The frozen chunks actually perform better because they make a colder and thicker drink. The problem is that fresh or on-its-way-to-freezing papaya chunks glue themselves to each other so what I would end up with was a solid mass of frozen papaya in the freezer bag. I scared El Jefe the last time he caught me jabbing a large chef's knife into the frozen papaya glob trying to break off some chunks. 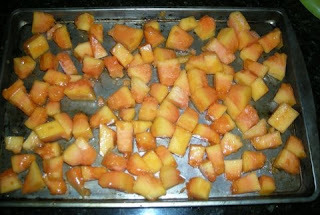 I don't know why I didn't think of it before, but the last time I cut up a papaya, I froze the pieces on a cookie sheet. I actually piled them higher than this photo shows but once frozen, it was relatively easy to break the chunks apart and put them in a freezer bag for storage. Now I have a nice bagful of loose papaya chunks and can just pour out the quantity that I need. Culture shock is often downplayed by those planning to move to another country. Often people think that they know a country and that they will adjust with no problems. Maybe some will, but I think that people are often affected more than they want to admit. The experts say that 'change' is the most stressful thing in a person's life, even when the change is for the better. Moving to another country results in more change than anything else I can think of − down to the air that you breathe. 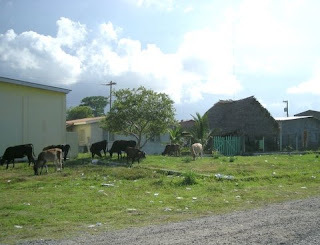 These are some of the first culture shocks that I experienced when coming to La Ceiba, Honduras. Ears: Music blasting so loud from stores and restaurants that it actually hurts and makes conversation is impossible. Communication has to be by hand signals, i.e., pointing, let's try that store. Eyes: Electrical wires strung like out-of-control cats in the cradle barely high enough for trucks to drive under. The ever present trash and malodorous garbage. The bars on every window and door and the razor and barbed wire everywhere. 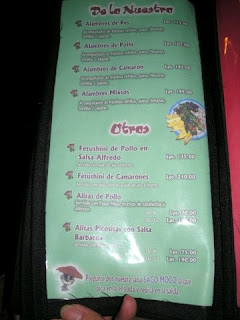 Nose: Rotted food, meat, fish − only in certain areas, though. Worst of all was the smell of diesel fuel which sometimes puts me into a coughing spasm the minute we get to town which doesn't quit until we leave. Mouth: For the first few weeks, I could feel the grease from the food coating the inside of my mouth. I was used to less fatty foods and it was a big adjustment. I felt like what grease wasn't oozing from my pores was settling in for a long stay in my rear end. I craved fresh vegetables the way I used to crave chocolate. Skin: Although I was used to hot weather (tempered by A/C, of course! ), Dallas has a very dry climate. I was not prepared for the oppressiveness of the humidity. Vacationing in it one thing; living and working in it is something else. Feeling sweaty all the time was not fun. Although our current living conditions now have alleviated that tremendously (less dust, more breeze, bigger windows, ceiling fans), the humidity still completely zaps the energy out of me some days. 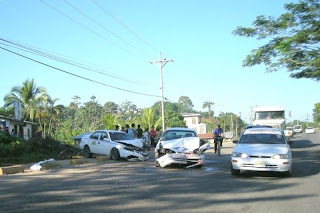 True fear: I truly have feared for my life from the crazy drivers and with good reason as hardly a day goes by that horrific traffic accident deaths are not reported in the newspaper. And very often they involve or are caused by the taxis and buses that I feared so much. I still worry about El Jefe all the time. 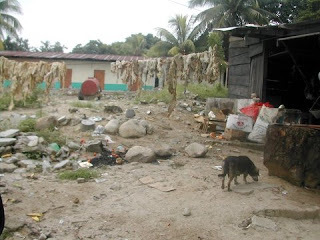 Poverty: No matter how in tune someone might be to the Hispanic culture, I think that everyone must be shocked by the extreme poverty in Central America. 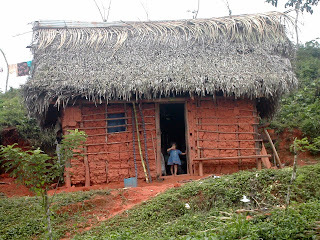 Until I got to know some people personally and was invited to their homes, I really had no idea of what poverty means in Honduras. We from the U.S. are likely to think of poverty as not being able to afford a new car and wearing old clothes. Poverty in Honduras can mean not being able to eat or to afford to buy a notebook and pencil or pair of shoes to send your child to school. Isolation: I didn't realize how much I would miss the English language. I knew some Spanish, but Honduran Spanish didn't sound anything like I learned or had heard on television. I didn't understand people and they didn't understand me. I found myself tuning out to everything around me, just like I do for commercials on TV. Those are just some of the things that came to my mind when I sat down to write this article. After awhile you get used to some things, adjust to some, some you just ignore because you can't do anything about it, and some will bother me until my dying day! What are some of the culture shocks that you've experienced or think that you would if you moved to another country? 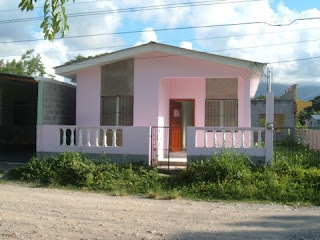 How much does it cost to buy a house in Honduras? I wish I had $10 for every time I was asked that question! It can cost the same, or more, or less than it costs to buy or build a house in the U.S. How much does it cost to buy a house in Ohio? How much does it cost to buy a house in Dallas? It is impossible to answer to those questions either without knowing a whole lot more details. The cost of a house, simply put, will depend upon what kind of house you want, what size of house, and where it is. The price of land varies tremendously. A tiny lot on the beach on the island of Roatan might cost vastly more than several acres in a secluded mainland location which, incidentally, might not have access to water or electricity. If you want a replica of an 'American' style house complete with all the quality amenities, you could pay even more than it might cost you in the U.S. as you might have to import those quality items that aren't available here and might even have to bring in experts to install them. Living in or near a big city or popular area will probably mean that labor costs will be higher while living in a smaller remote town will probably mean that material costs will be higher (lack of competition plus transportation costs). So even cost per square foot will vary a lot depending upon what part of the country you are considering. I'm not a real estate agent and I don't have any reason to keep up with prices. 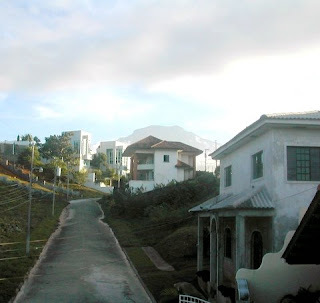 Right now in La Ceiba, judging by the ads in the newspapers, there are many houses available in the US $50-60-70,000 range. As to whether those houses would suit your needs or whether you would want to live in those areas, I have no idea. There are houses even less expensive than that, but if you are partial to electricity, like to have water at least most of the day, want a kitchen with more than 18 inches of counter space or a lot with more than a postage stamp-sized yard, you might have to increase your price range. There are just too many variables for me to even attempt to guess! I would say, however, that if you are thinking you can build or buy a house for US $10-20,000, it ain't gonna happen! 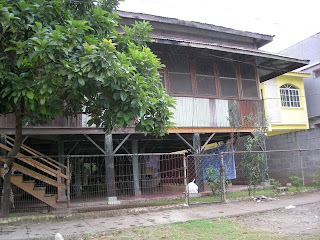 US $100-200,000 is more likely to get you a house like you are used to. 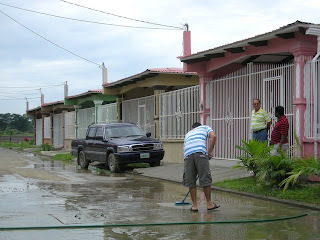 I have included a few articles on my blog about some of the colonias (neighborhoods) around La Ceiba. I plan to do more of that just because so many people seem to be interested in houses. 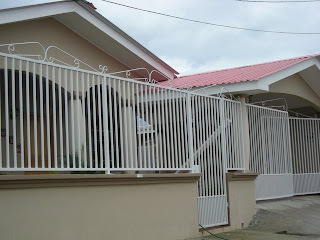 I enjoy looking at houses and because we have so much new construction going on, there is a lot of material out there. In fact, I'll add a "Housing" topic in the sidebar to make the articles easier to find. 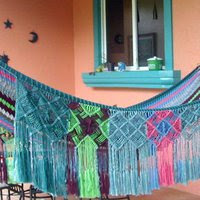 For those of you serious about moving to Honduras who want to see what is available, I have a few suggestions. 1. 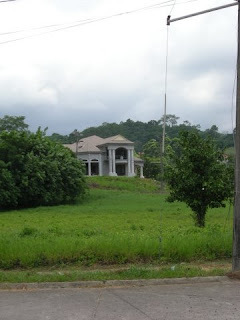 First and foremost, do not ever consider buying property in Honduras without seeing it in person (especially during rainy season), talking to neighbors, hiring a good attorney, and doing all the other due diligence (plus some) that you would perform anywhere else. 2. I always recommend that everyone come down and rent for 6 months to get familiar with the area and find out if living here is what you really want. Renting is cheap and much less expensive than finding out later that you've made a terrible mistake. 3. 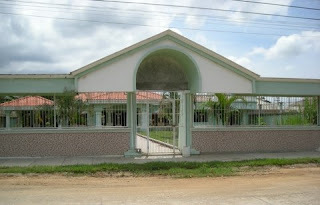 Google "Real Estate Honduras" or "Real Estate La Ceiba." 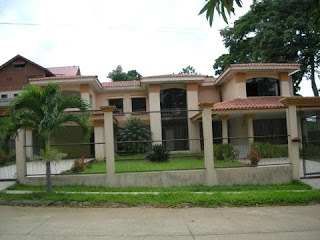 Not all real estate companies have websites in English, so also Google "Bienes Raices Honduras." 5. If you are taking my advice from #2, while you are here, drive around. See what areas you like. Talk to several agents. Look at as many houses as you can to see what is available in your price range. Talk to people that you meet. They may know of something available or may know of problems in the area that you are considering. If you are interested in seeing a particular colonia, let me know. If it is close by and if I can, I'll do an article and take some photos of the houses and neighborhood in general. I won't do your due diligence or make appointments with real estate agents, though! 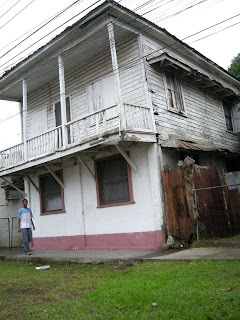 Now here is a house that you might be able to get for under US $10,000, but chances are that the homeowner does not own the property that it is sitting on. In the restaurant business, you gotta have something: Good food, good service, nice atmosphere − preferably two out of three. Annoying service really ruins a restaurant experience for me. We don't expect fast service, even if we are the only customers in the restaurant. We don't even expect particularly friendly service anymore. What I really dislike is when we are treated as if our being there is just a nuisance. 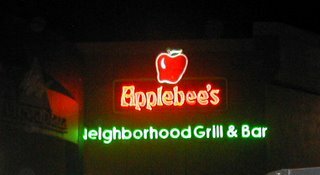 One of my favorite stories is the time that we spent almost two hours in Applebee's (where the waiters are trained to be friendly) and never heard the sound of our waitress's voice. She walked up to our table with a glum look on her face, pencil in hand, and dejectedly stood there waiting for us to say what we wanted. She brought the drinks and later barely slowed down to plop the food in front of us without a word. Afterward we waved her down to order dessert. She gave us an annoyed look and walked away without even a nod as an acknowledgment that she heard us. The check was similarly handled with sour looks and without speaking, by which point I couldn't help but giggle. She was behaving like a small child who had just been given a time-out. She was going through the motions but clearly wanted to let someone know that she wasn't happy about it. Being a really good waiter is a talent, but I believe that being an adequate waiter only takes a little common sense. 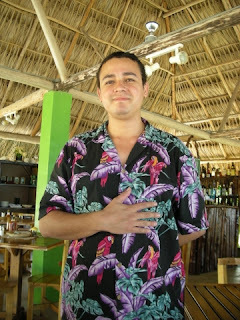 I realize that most waiters in La Ceiba probably don't often or maybe ever go to a quality restaurant and haven't been exposed to excellent service, but I look at it as just treating a customer the way you would treat a guest in your home. That should get you by. A little common sense and a simple smile goes a long way with us. Waiters bring the appetizers and the main course at the same time. 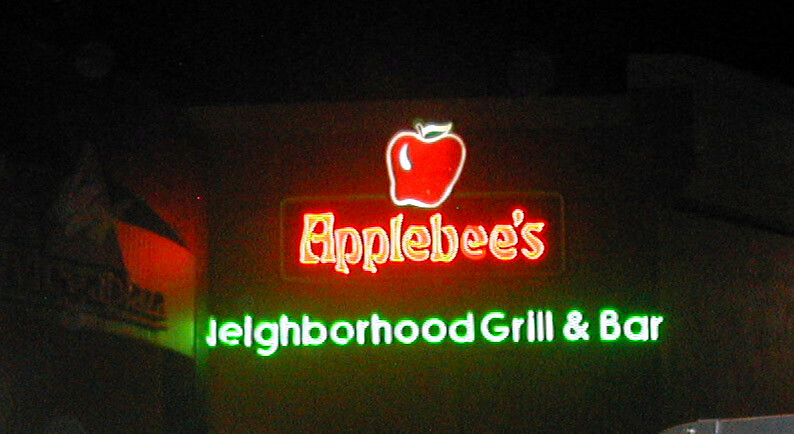 (Applebee's, La Palapa Mexicana, Expatriates, Quinta Real Hotel) Tip: Order the appetizer, keep the menu and don't order the main course until the appetizer is served. 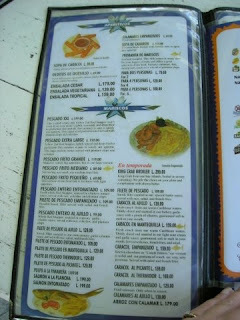 The restaurants mentioned are some of the nicer restaurants in town. I don't expect any more than to have the food plopped down in front of me at the hole-in-the-wall places, but I do expect better at these restaurants. We have dumbed down our service expectations to an incredibly low level, but still things happen which continue to surprise us. I blame the poor service on the fact that most La Ceiba restaurants now automatically add a 10% tip (the traditional tip rate in Honduras) to the bill and from what I hear, that entire 10% is rarely given to the waiter so they have no incentive to do better or "sell" more. 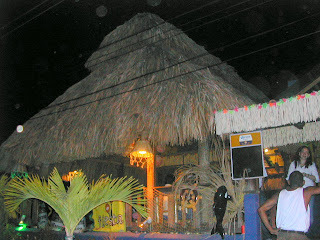 We give an extra tip when the service is good, but it is rare except at Playa Taty's Restaurant. Restaurant owners: Are you listening? Your help needs some training and supervision! You may have trained them, but while you are at home or hiding in your office, they aren't doing what you told them to do. And speaking of hiding, why don't the managers or owners EVER come around to check on the customers? It could be very enlightening. A little bit of your time might help you to spot the employees who are driving away your customers. I've read a long time ago that the tourist association in La Ceiba was planning training classes for waiters and others who deal with tourists. Some tourist business owners recognize the problem but don't always know what is going on when they aren't looking or just don't know how to motivate their employees. I don't know if the classes were ever held but it definitely sounded like a good idea to me and something that should be done regularly because of the high turnover. People don't come to La Ceiba expecting 5-star service, but on the other hand, most people do expect that their patronage will be appreciated at least a little. All that marketing of La Ceiba as a tourist town and the friendliest city in Honduras where everyone smiles is being tarnished. 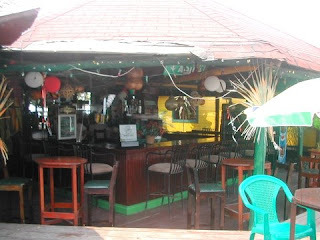 PS: I've heard that La Palapa Mexicana, which you read mentioned so many times above, is closing down. 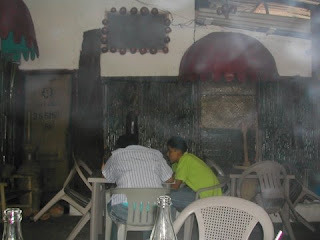 Could it be that the good food and nice atmosphere just couldn't compensate for the bad service?